Showcase your adoration—whether for a pet, family member, or friend—with this unique film strip art. Your phone's camera roll is brimming with cherished memories of loved ones. Showcase your adoration—whether for a pet, family member, or friend—with this unique Film Strip Photo Art™. 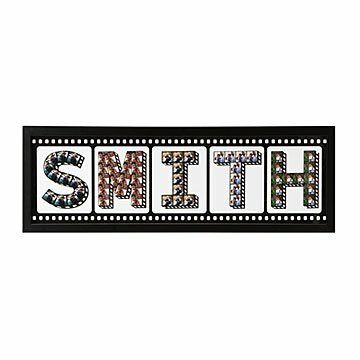 From a few steps back, the framed piece displays their name in cheerful type, but step closer and each letter features its own special picture of them in a creative repeating pattern, as if on a roll of film. It's a playful yet sentimental expression of your love, and designed to become an instant classic. Printed and framed in Portland, Oregon. Your phone's camera roll is brimming with cherished memories of loved ones. Showcase your adoration—whether for a pet, family member, or friend—with this unique Film Strip Photo Art®. From a few steps back, the framed piece displays their name in cheerful type, but step closer and each letter features its own special picture of them in a creative repeating pattern, as if on a roll of film. It's a playful yet sentimental expression of your love, and designed to become an instant classic. The Film Strip Photo Art: 1 Line is packaged in a partially recycled and fully recyclable/compostable box. There's one place—and only one place—where you'll find the Film Strip Photo Art: 1 Line: UncommonGoods.